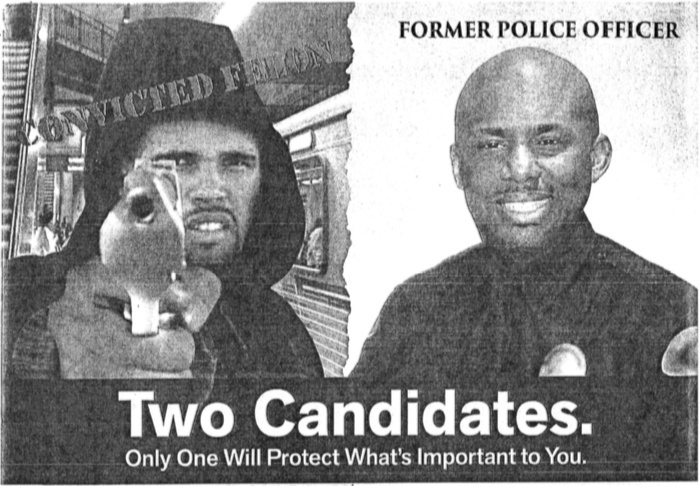 An image provided by Prophet Walker's attorneys shows part of a campaign mailer sent out by then-California Assembly candidate Mike Gipson that superimposed Walker's face over a hooded figure holding a handgun and pointing it at the viewer. California Assemblyman Mike Gipson is being sued over a campaign mailer from the November election that depicted his opponent as a hoodie-wearing, gun-wielding criminal. The suit, filed Wednesday in Los Angeles Superior Court, alleges that Gipson's false and misleading campaign tactics caused "great damage to Prophet Walker's public standing and prospects for employment." The mailer in question included a photo that had been heavily doctored by superimposing candidate Prophet Walker's face over an image of a hooded person leveling a handgun at the observer. Next to this image was one of Mike Gipson in a police uniform, and under both pictures ran the line, "Only One Will Protect What's Important to You." The suit alleges that Gipson's mailer was a "malicious" violation of election laws, because it failed to disclose that the image was modified and because it was a false depiction of Walker. Walker is an ex-convict, having served six years for robbery, but the steps he took to turn his life around formed the substance of a redemption story that eventually got him the attention of President Barack Obama. Walker was a guest of First Lady Michelle Obama during the president's State of the Union speech in January. While he was in prison, Walker started a program to help fellow inmates earn a two-year college degree. He graduated from Loyola Marymount University’s engineering school and also helped co-found a program called Watts United Weekend, which takes kids from local housing projects on weekend retreats. During the campaign season leading up to the November election, Walker was the underdog in a race for the 64th Assembly District, which represents Carson, Compton, Watts, parts of South Los Angeles, and other cities in south L.A. County. Gipson, a former mayor of Carson and a former Maywood police officer, was the better-known and financed candidate, and he ultimately prevailed, securing 64 percent of the vote compared to Walker's 36 percent. Cynical observers might argue the suit is a lot of fuss over what amounts to standard practice in politics. After all, mud-slinging has been around as long as people have been running for office. But Gipson's mailer drew broad criticism for its blatant visual deceit and because the imagery was eerily reminiscent of Trayvon Martin, the young unarmed black teenager who was shot and killed by a neighborhood watch volunteer in Florida. Dan Morain of the Sacramento Bee called it "one of the most vile mailers I've ever seen." Celeste Fremon, who runs the blog Witness L.A., said it was "loathsome," enough mud-slinging to make "even cynical campaign watchers blanch." Los Angeles News Group's editorial board called it the "most egregious dirty campaign flier in a local race that members of this editorial board can recall in decades of experience." Scott Lay, who puts out daily political newsletter "The Nooner," called the move "abhorrent" and "reprehensible." The election code prohibits candidates from maliciously manipulating photographs of their opponents. Victims can sue, but damages are limited to the amount of the cost of the mailer and attorneys' fees, hardly worth it. The lawsuit does seek punitive damages, but at its root this case is at least as much about political justice, attorney Bryan Freedman, who is representing Walker, told KPCC. Freedman said it was a recent story about Gipson's consultant quitting that may have finally prompted Walker to bring the suit forward. "Mike went rogue for the last week of the campaign and made a series of regrettable decisions," Pulliam told CalNewsroom.com. "Apparently among them was hiring Angel Gonzalez — a local consultant who was convicted of sending out illegal campaign mail with faked images." The suit alleges that Gipson and Gonzalez together came up with the mailer but that Gipson later lied about it. As part of a public apology he made earlier, Gipson appeared to lay blame at least partially on a campaign volunteer, making no mention of Gonzalez, according to Witness L.A. It was this apparent cover-up that Freedman said made the situation worse. 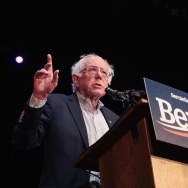 "People violate election laws all the time, but when someone says to his constituency, 'This is what happened,' and it turns out to be a lie, there's a fundamental belief that you get excited to right a wrong," Freedman said. "This is not a guy who made a mistake. This is someone who did something maliciously and didn't tell anyone what he was doing, and went rogue." Freedman said his client wants the public to understand that Gipson lied to the public he has been elected to represent, and that any settlement that may be reached as a result of the lawsuit has to involve an admission to that effect. KPCC reached out to Gipson's office for this story, but his press secretary, Jonathan Feldman, said they would not comment until they had reviewed the case. Can Carson prevent bullying by making it a misdemeanor?